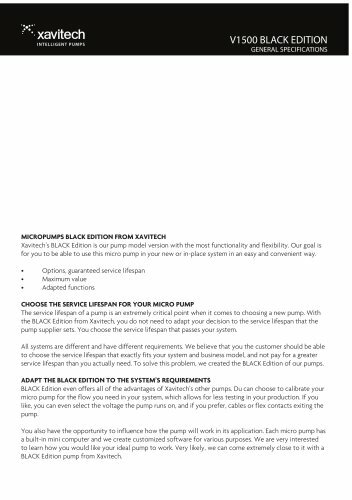 INTELLIGENT PUMPS V1500 BLACK EDITION GENERAL SPECIFICATIONS MICROPUMPS BLACK EDITION FROM XAVITECH Xavitech’s BLACK Edition is our pump model version with the most functionality and flexibility. Our goal is for you to be able to use this micro pump in your new or in-place system in an easy and convenient way. • Options, guaranteed service lifespan • Maximum value • Adapted functions CHOOSE THE SERVICE LIFESPAN FOR YOUR MICRO PUMP The service lifespan of a pump is an extremely critical point when it comes to choosing a new pump. With the BLACK Edition from Xavitech, you do not need to adapt your decision to the service lifespan that the pump supplier sets. You choose the service lifespan that passes your system. All systems are different and have different requirements. We believe that you the customer should be able to choose the service lifespan that exactly fits your system and business model, and not pay for a greater service lifespan than you actually need. To solve this problem, we created the BLACK Edition of our pumps. ADAPT THE BLACK EDITION TO THE SYSTEM’S REQUIREMENTS BLACK Edition even offers all of the advantages of Xavitech’s other pumps. Du can choose to calibrate your micro pump for the flow you need in your system, which allows for less testing in your production. If you like, you can even select the voltage the pump runs on, and if you prefer, cables or flex contacts exiting the pump. You also have the opportunity to influence how the pump will work in its application. Each micro pump has a built-in mini computer and we create customized software for various purposes. We are very interested to learn how you would like your ideal pump to work. Very likely, we can come extremely close to it with a BLACK Edition pump from Xavitech.